This past weekend, late in the evening, as I was fiddling around with the ATS-4 seeing how the bands were doing, I ran across a particularly strong CW signal on 10.116 MHz, near the bottom of the 30m band. It turned out to be the end of a QSO between KA7OGK and W5IP, the latter of whom was coming in 5-by-8 here in Chicago. When they wrapped up their conversation, I through out a quick call to W5IP, and she came back! I could tell that Carroll (whose name I’d gleaned from the earlier conversation) was heading out, as our exchange was much more perfunctory than conversational. But it allowed me to put my first 30m contact (as well as my first Texas station, as it turns out). And with that, I’ve now made a contact on every band I currently have access to – 80m, 40m, 30m, 20m, and 15m! So far 40m and 20m have proved to be my workhorse bands, but some late-night exploration makes me think I should be paying more attention to 80m later in the evening. Until I can put a longer or more-vertical Antenna in the air, I don’t think I’ll be chasing foreign counties for a little while, but Worked-All-States seems like an achievable short-term goal. Of course, of the 10 states I’ve worked, I only have confirmation from California and Pennsylvania, so there’s a way to go yet. But I’m having a great time acquiring my own “All Time New One” states. Having put up a basic wire antenna last week, I thought I might as well give it a spin over the weekend to see how well it might receive on the various bands I have access to. This being the weekend of the California QSO party, I figured there would be lots of big signals on the air to try to hear. Much like when I first put the QST-49er on the air, I had much higher expectations for reception that for anybody else hearing me, but I was to be proved wrong. Using the ATS-4, my power output is about 3W on 80m, 40m, 30m, and 20m, and about 2W on 15m. I figured I would find the strongest calling stations that I could and use them as a gauge of where I was receive in signals from. Much to my delight, the CW portions of both the 20m and 15m bands seemed to be filled with California stations calling “CQ CQP” (California QSO Party). Some of them S7, a couple over S9 even with my simple antenna. With no AGC, some signals were strong enough as to require me taking the earbuds partially out of my ears. With propagation and the antenna seeming to cooperate, I quickly looked up with CQP exchange (serial number and state) and responded to some of the CQs. One of Eric Guth’s guests on the QSO Today podcast (and I can’t for the life of me find who) expressed that the joy of radio sport for him was that he got a little spark of joy every time he made a new contact, and that contesting gave him that feeling hundreds of times in a row. While I didn’t hit hundreds of times, I certainly felt the rush of making contest contacts, fighting to be heard with other stations, the victorious feeling of finally being heard, the reward of persistence…. I could get into this radio sport thing. If that’s going to be an area of interest, I’ll need to practice a little more on my reception speed, especially when it comes to numbers. For this contest, I would often listen to the California station go through two or three other contacts to try to pick out the serial number he was on and his county before I’d make a call myself. My receive speed just isn’t high enough to go into a contact from scratch. But I’m grateful to all the ops who were willing to slow down and repeat themselves when asked. It made me feel very welcome as a new op. I suspect my actual score will be much less than that. I know I botched a couple numbers early on, and even gave out the wrong number once (oh the shame). But even if I only get one point in the log, that’s good enough for a first time out. Hear you in the air, and in the contest! Sometimes the simplest of radio work pay the biggest dividends. Last week, after a few weeks of hemming and hawing about it, I finally committed to putting up a longer wire antenna that allowed the possibility of using multiple bands. The 40m dipole I put up at the end of August has proved to be fine as a receiving antenna, but it suffers two key limitations. First, it’s obviously a single-band antenna (though I may try it on 15m as well). And second, situated as it is between two apartment buildings, I think I’m wasting most of my energy heating up the bricks rather than propogating energy out into the world. 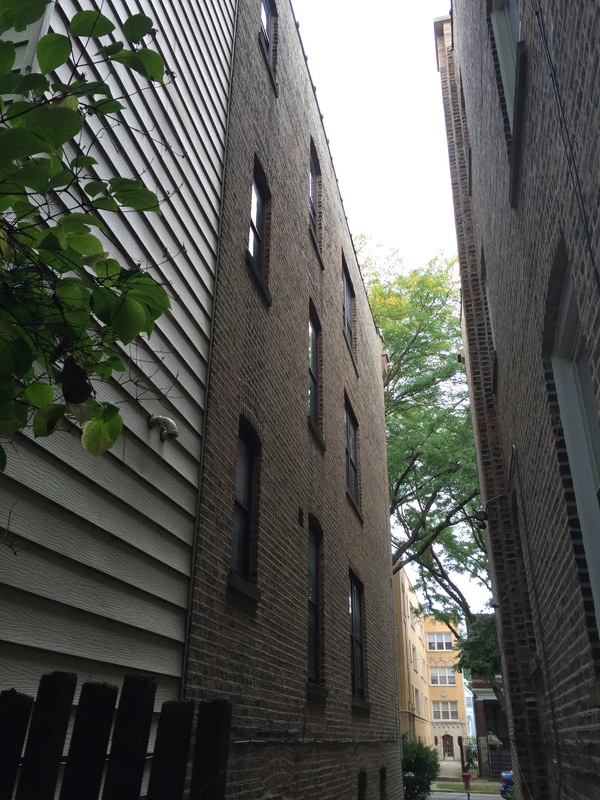 It’s also only ~10′ off the ground. The new antenna helps with all of these issues. It’s simply a ~58′ piece of 22-gauge speaker wire strung from the office window out to a tree that sits in the apartment’s back yard.at its highest, the wire is maybe 20 feet up. While it’s a little visible in the alley if you’re looking for it, it blends in with the surrounding tan brick enough that I don’t think it’ll be noticed. I dropped a ~16′ piece of the same wire out the window to act as a counterpoise. No, I swear, there’s an antenna running right through the center of this picture. Like any random-wire, this one needs a tuner to be useful. I first tried using the ZM-2 tuner I got last Christmas. I sadly think I have a short in one of the variable caps in that tuner, which makes it non-functional for now. The MFJ-949e tuner did the trick though – I attached the long wire directly to the “WIRE” banana jack on the back, and the counterpoise to the grounding lug. The antenna tunes up better than 1.2:1 on 80m, 40m, 30m, 20m, and 15m. Which doesn’t necessarily mean it’s an efficient antenna, just that it won’t unduly stress my transmitters. When I tuned the antenna the first time, I made myself a cheat sheet of the capacitor and inductor settings that gave me the lowest SWR on each band. 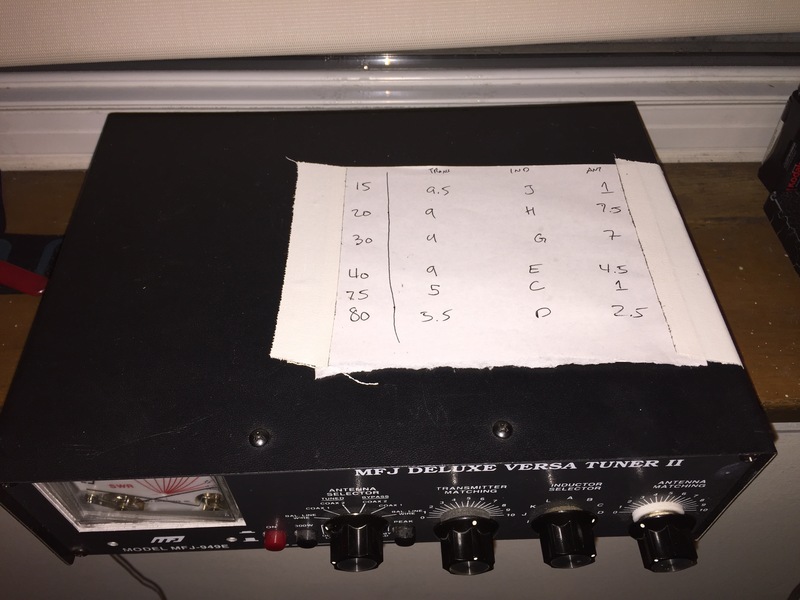 I then taped this cheat sheet to the top of the tuner. This gives me a place to start when I need to retune for a particular band. The same evening that I put the antenna up, I did a tune-through of the CW portions of 15m, 20m, 30m, and 80m. It’s really the first time I’ve been able to hear anything on a band beside 40m, so I figured a little exploration was due. I came across an S7 signal at 3.545 MHz calling CQ, and just for grins, I gave him a call. And he came back to me! Arthur, N8ART in Columbus Ohio, running an older rig into a dipole, if my copy was right. Columbus is a little under 300m from my QTH in Chicago, so this was probably a single-hop contact, or really NVIS. But it represents my first contact outside of 40m, which is terribly exiting! The new antenna is already proving its worth. 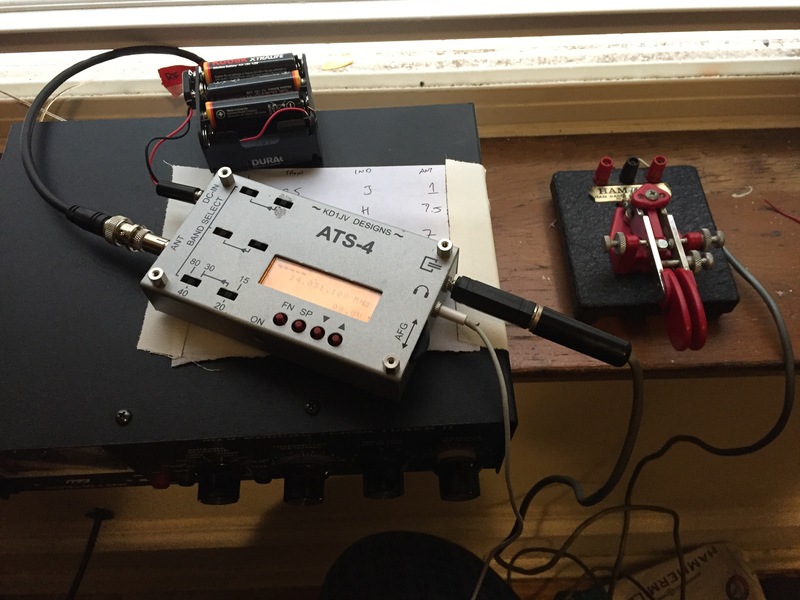 This was also my first contact with a new transceiver, an ATS-4 which I snagged as a “tech-special” (i.e. broken) from qth.com and repaired. That process deserves its own write-up. I’m also using a second-hand Ham Key I picked up at Radio Expo 2016 in Belvidiere, an event that also deserves its own post. But really, I’m just too excited about the contact on a new band to try to keep these posts strictly sequential. Hear you on the air, maybe on 80m!